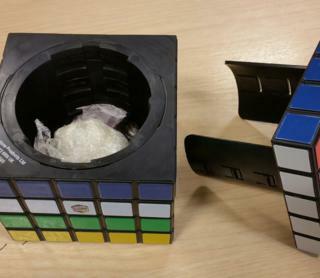 Police discovered more than 50 wraps of what are believed to be Class A drugs in a fake Rubik's cube container. Kent Police said the container was slightly larger than a usual cube, and held wraps of white and brown substances. A 19-year-old man from Stratford, east London, was arrested in Newham Street, Chatham, on Wednesday. Officers said he was questioned on suspicion of supplying a controlled drug and bailed until 3 October.